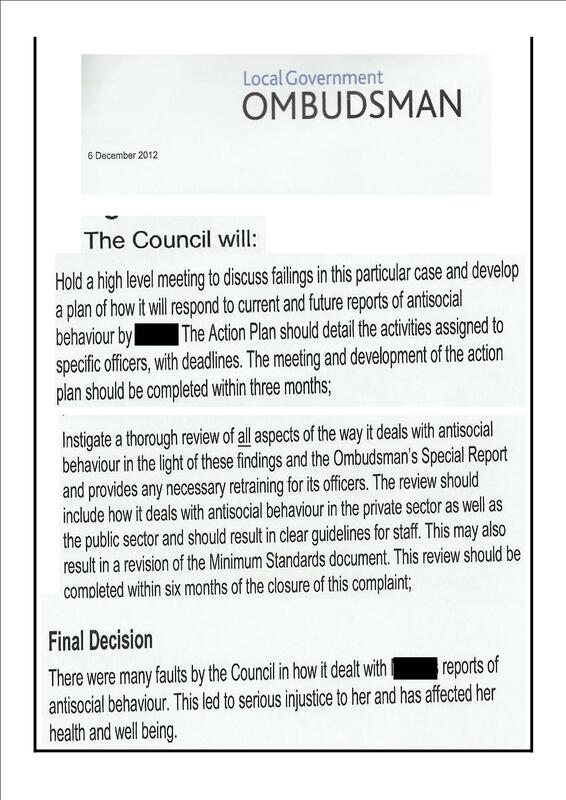 What is it with Lewisham Council and MPSLewisham keeping people in the dark about their rights when it comes to ASB? They did it regarding their joint ‘ASB Minimum Standards’ and there has also been a complete lack of publicity about the Community Trigger. The Community Trigger came into force on 20th October 2014 to ’empower victims and communities’, this by enabling victims of Anti-Social Behaviour to insist on a multi-agency case review if they had reported a minimum of three incidents in the past six months but the ASB was still continuing. There has been concern about the way Councils have implemented and are adhereing to the Community Trigger and its aims, these are detailed in a Report by ASB Help, the link to which can be found at Community Trigger: Empowerment or Bureaucratic Exercise? No “consideration” then, just what suits the Council and their partners – who it seems cannot be trusted to deal appropriately with correspondence tsk tsk – so much for “empowering victims”. and what are these “effective mechanisms for escalation”? What could they be, escalated how, to whom? Not to a multi-agency case review obvs because that’s the Community Trigger and that had never been activated. “The legislation sets out the minimum criteria for the threshold of when the trigger can be activated. Lewisham has adopted this, as most other boroughs have. If a resident/ complainant is dissatisfied that the response is not timely or effective then they have the opportunity to complain using the council’s service complaints procedure. why doesn’t the Council give the Community Trigger widespread publicity, and why isn’t it widely publicised by Lewisham police, and the other relevant agencies? I could not find Community Trigger on the Metropolitan Police website (I searched for “community trigger” and “trigger” and also looked on their two anti-social behaviour pages). Using the same searches as for MPS I could not find Community Trigger on these example housing providers’ websites – Phoenix Housing, L&Q, Hyde, Lewisham Homes, Regenter, Amicus Horizon. Affinity Sutton made the barest mention of it in an FAQ-style list. Family Mosaic stated in an ASB policy PDF document “People can activate a Community Trigger by contacting their Local Authority”. The vast majority who searched the MPS and/or their housing provider websites for info re ASB would clearly be none the wiser about their right to activate CT. When I replied to Cllr Daby explaining the above and that it was not correct that housing providers and the Met police advertise Community Trigger on their websites she replied “sorry but I don’t think I can add to this any further”. I checked the Met Police website again today, 16/02/18, using the same searches but still could not find any mention of the Community Trigger. Don’t tell anyone though, it’s a secret. First armed with a long stick (first two pics), 25 mins later with a small stick (or a knife?) (third pic) – anyone know where it lives let me know (in confidence of course) so I can return the favour. This is the coward who caused criminal damage on 15/08/17, any info on where it lives please let me know, in full confidence of course. Why didn’t PS Anderson state all this, and the rest, for “the uninitiated”? “This year” Lewisham Council had continued to ‘lose’ CCTV evidence and Lewisham police had continued to falsely report incidents. my car: wing mirror broken off, rear windscreen smashed, indelible graffiti, repeatedly kicked, repeatedly spat on, scratched and dented, food thrown onto it, burning cigarette thrown onto it. repeated verbal abuse – including obscenities F-word, C-word, b*tch, w*nker and ‘hate’ abuse – when I’ve gone outside and into my back garden. This is “minor criminality” is it Lewisham police?! had maliciously referred me to mental health services using the big fat lie about CCTV to claim they belived I was mentally ill and suffering delusions incidents were happening. and when there is ample evidence of serious misconduct by Lewisham police officers. that’s some determination to discredit me! it’s clear that both Lewisham Council and police knew the truth about the CCTV at the time of their meeting 26/08/11. and after my extensive email communications with Lewisham police asking for their help re all the CCTV evidence being lost. and footage for only one incident had been successfully retrieved from the covert camera but Lewisham Council themselves described that one piece of footage as “poor quality” and “very poor quality“. so why isn’t the truth stated in the minutes? yet no-one ever told me about that supposed fault despite during that time I was reporting incidents, they were retrieving the cartridge, and I then had to keep asking about the footage but they never let me know/answered me. and Lewisham police, Lewisham Council and my MP had seen themselves the extent of the damage to my car when they had visited me during those nine months. and because of all the lies and cover-ups by Lewisham police I am still having to try to get my complaints properly investigated, so it is still taking up my time and effort, to correct all their lies about me which are all over official police records. but they just carried on as before, continuing to lie and treat me appalling. As above, once lies are ‘validated’ in the minutes of a joint Lewisham police/Lewisham Council meeting that document is on record as if ‘factual evidence’ of the situation, and the document containing the lies is then produced to discredit someone critical of them. This is to prove that Lewisham police knowingly and deliberately lied in a Referral to mental health services. Having failed to secure a malicious conviction against me/have me sent to prison, Lewisham police then – as part of what I can only call their concerted campaign to discredit me to cover up their own misconduct – maliciously referred me to mental health services. the same big fat lie that they had knowingly and deliberately told in a Witness Statement and Case Summary after they maliciously arrested me – ‘verballed’ me – on 02/09/11. the trial was on 28/10/11, I represented myself at the Court and was mentally competent enough that proceedings were halted half-way through the prosecution case and the District Judge ruled I had “No case to answer” due to “inconsistencies” and “conflicting” police evidence. and PS Duncan Anderson himself had written those minutes! So, as Lewisham police were fully aware CCTV hadn’t even been retrieved why would they lie about it in a Referral? Why would they lie to ‘justify’ Referring me? Lewisham police – having failed to discredit me via a malicious conviction – were now seeking to exploit the stigma of mental health to discredit me and cover-up their serious misconduct. Lewisham police knowingly and deliberately lying in a Referral was not only a serious injustice and malice towards me, it was also an outrageous and disgraceful abuse of the MH Referral process. Lewisham police were also fully aware that my front window had been smashed around 22 September 2011– hardly a ‘delusion’…but they had to lie about that too, to keep covering-up the true situation and their failure to take appropriate action to protect me and my property. I was told my complaint could not be investigated until after conclusion of the trial on 28/10/11 – I represented myself at Court and the outcome was “No case to answer” – so the Referral was made at the same time the investigation into my complaint began. which of course actively encouraged the perpetrators to continue their ASB/harassment/ hate, they were getting their sick, perverted pleasure out of it, why stop when they knew there were never any consequences for them. so that’s yet another Lewisham police lie I can prove is a lie.